A 4 year old boy was referred for evaluation of failure to thrive, and mild cyanosis. He was recently hospitalized elsewhere for an episode of incoherent speech and decreased responsiveness for a few hours; however, no diagnosis was established. On examination, heart rate of 100/minute, blood pressure of 96/60 mm Hg, mild cyanosis and grade 1 clubbing were seen. Oxymetry showed a saturation of 85%. Rest of the physical examination including cardiac auscultation was unremarkable. Routine biochemistry including liver function tests, were within normal limits. Chest radiograph revealed mild cardiomegaly and clear lung fields. A transthoracic echocardiogram showed a structurally normal heart; however, contrast echo was suggestive of pulmonary arterio-venous fistula (PAVF), as the contrast appeared on the left atrium after 3-4 cardiac cycles [supplementary Video]. However, computed tomography (CT)- scan of chest was normal. Hence, microscopic PAVF were suspected. An abdominal ultrasonogram (USG) was done to evaluate the hepato-portal system. The USG revealed normal echo texture of liver, with severely attenuated main portal vein, and intra hepatic portal venous radicles. No appreciable colour flow was seen within them on colour Doppler. It also revealed a large collateral from splenic vein joining the systemic veins. 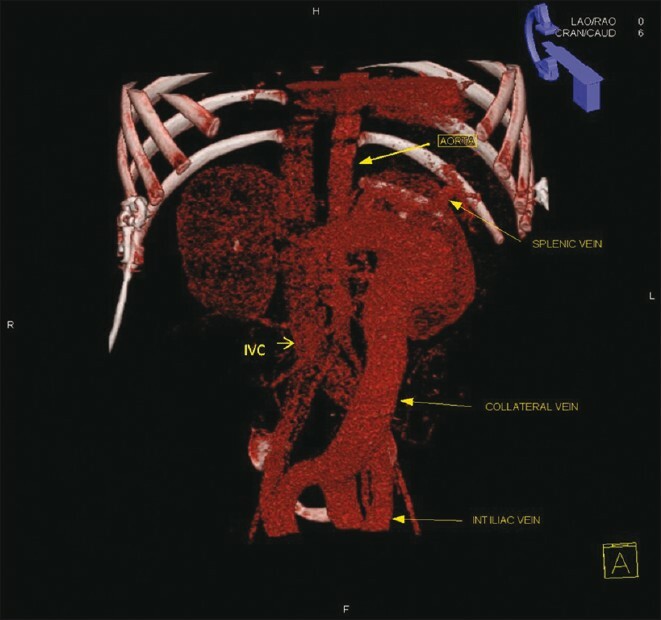 Later, a Contrast-enhanced computed tomogram (CECT) abdomen confirmed the presence of large collateral from splenic vein that traverses downward to join the internal iliac veins on both sides after its bifurcation [Figure 1]. Though a small extra-hepatic portal vein was seen, there was no clear evidence of an intra hepatic portal venous system. Diagnosis of Abernethy syndrome was made. PAVFs in the context of hereditary hemorrhagic telengiectasia (Osler-Weber_Rendu syndrome), liver disease (hepato-pulmonary syndrome) and following bidirectional Glenn operation are well recognized. However, portal systemic abnormalities in the absence of obvious liver disease resulting in PAVF is not as well appreciated. Porto-systemic communications or Abernethy syndrome may be either extra hepatic or intra hepatic in nature. The extra hepatic communications are further classified as type 1 or type 2 based on completeness of drainage of the portal venous blood [Figure 2]. Type 1 extra hepatic shunt is commonly associated with other anomalies that include cardiac defects (60%), polysplenia (20%), biliary atresia (20%), situs inversus (10%), and malrotation (10%). The pathogenesis of PAVF with liver disorders remains speculative. A hepatic factor, excessive vasodilator Nitric oxide (NO), increased endothelin-1 (with increased endothelin-receptor B) have been incriminated to cause PAVF. , PAVF in Abernethy syndrome suggests that dietary factor(s) bypassing liver seem(s) more important, as the liver blood flow to lungs is otherwise normal in these patients. In patients with Abernethy syndrome, treatment of the anatomic abnormalities may result in cure of the disease in selected cases. Liver transplant is the only option in case of type 1 malformations, and also was in the present case. The timing of liver transplant would be a matter of clinical judgement. Surgical ligation and endovascular treatment are increasingly used in type 2 malformations. Thus, every patient with diffuse PAVF should be evaluated for portal -systemic venous malformations. 1. 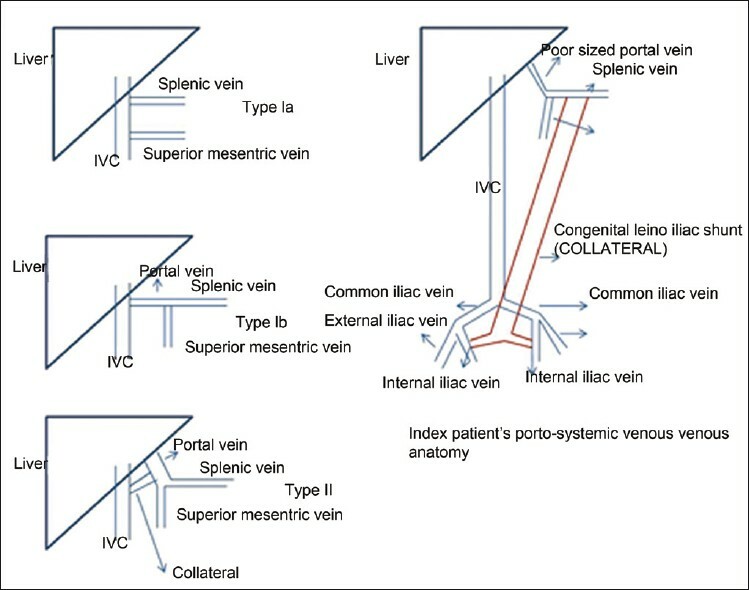 Morgan G, Superina R. Congenital absence of the portal vein: Two cases and a proposed classification system for portasystemic vascular anomalies. J Pediatr Surg 1994;29:1239-41. 2. Cremona G, Higenbottam TW, Mayoral V, Alexander G, Demoncheaux E, Borland C, et al. Elevated exhaled nitric oxide in patients with hepatopulmonary syndrome. Eur Respir J 1995;8:1883-5. 3. Tang L, Luo B, Patel RP, Ling Y, Zhang J, Fallon MB. Modulation of pulmonary endothelial endothelin B receptor expression and signaling: Implications for experimental hepatopulmonary syndrome. Am J Physiol Lung Cell Mol Physiol 2007;292:L1467-72. 4. Lautz TB, Tantemsapya N, Rowell E, Superina RA. Management and classification of type II congenital portosystemic shunts. J Pediatr Surg 2011;46:308-14. Subramanian, V., Kavassery, M.K., Sivasubramonian, S., Sasidharan, B.